The new commuter rail line starts at Denver’s Union Station, seen here on the rail line’s opening day. 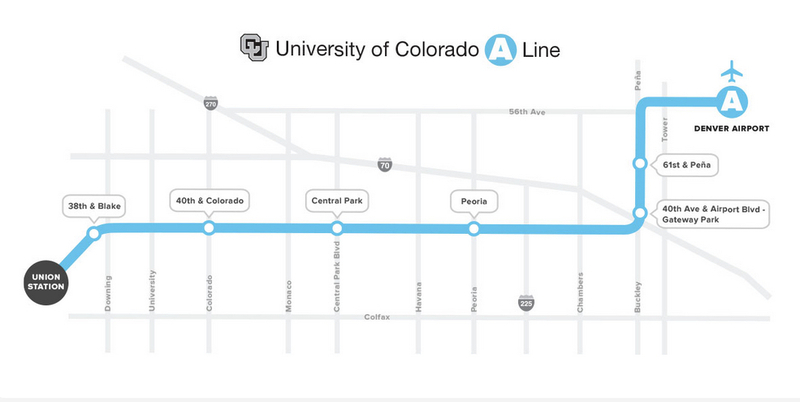 The “train to the plane,” officially known as the University of Colorado A Line, started running today between Denver’s Union Station and Denver International Airport, and it is, without a doubt, going to be a game-changer for the region. In 37 minutes, riders can get between downtown and the airport on a commuter rail line that runs every 15 minutes, removing the wild card of I-70 traffic, reducing the time needed for parking and shuttling once at the airport, and providing point to point service between the international hub that initially brings people to this city (the 6th busiest airport in the world) and the heart of downtown Denver. 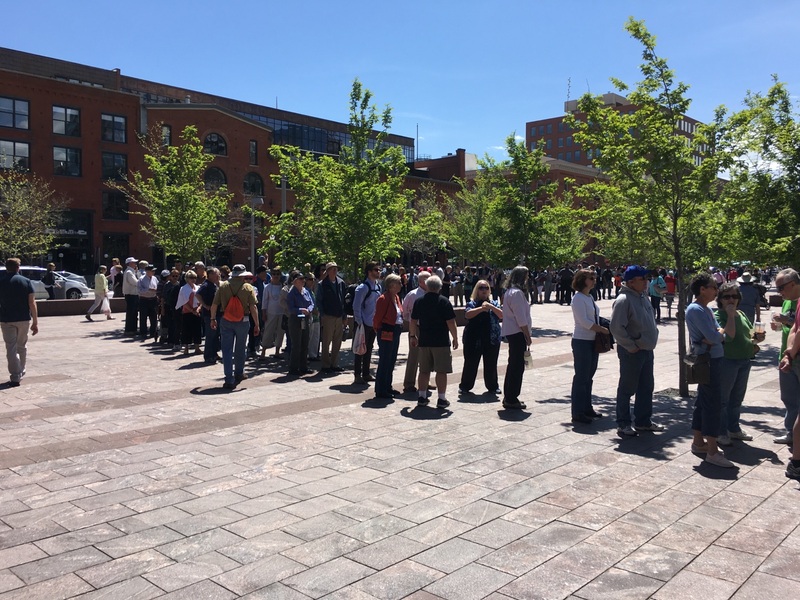 People waited in a line that extended from behind Union Station all the way around it and to the front of the building. Lines of people eager to take a free ride lined up behind Union Station, around the corner of it…and then around the corner again all the way to the front of the building. 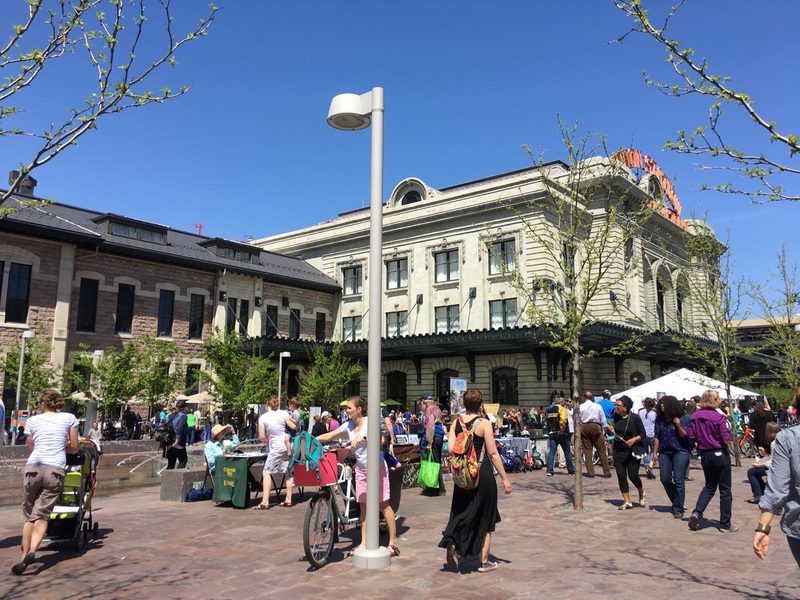 The energy and excitement around the new rail line was palpable, and the beautiful rehabilitation of Union Station provided a spectacular setting for such a monumental event for the city. The new line enhances our credibility and functionality as a major international city in which to live, work, and play, makes it easier for residents and visitors to get to and from the airport, and has already served as an engine for development downtown and in the northeast quadrant of the city. RiNo has exploded in the last few years, and this new line will only further enhance its rapid development. Now, neighborhoods like Whittier, Cole, Swansea, Globeville, Clayton, North Park Hill, Stapleton, Montbello, and Green Valley Ranch will have even easier access to the heart of downtown (and to the airport)–and while these neighborhoods have already seen significant appreciation in real estate prices in anticipation of the new line, expect values to rise and development to take off even more rapidly now that the line is complete. And fun fact: if you’re a beer lover (whether you live in Denver or want to come from afar to enjoy what we have to offer) there are at least 20 breweries within one mile of a stop on the new line (here’s an article with them all). Denver has been getting lots of Good national press lately, and with the new A line out to the airport, the recently launched W line from Denver to Golden, the forthcoming B line to Boulder, and all of the other Good things going on in this city, I believe the sun is rising over a truly great new era in Denver’s history. For those of us who live here, we are all very lucky to be experiencing and participating in it. For those of you who are reading this from elsewhere–come see what the excitement is all about!